Tamayura ~hitotose~ 1 – did you make these yourself? The power of photography and other arts and crafts is explored. 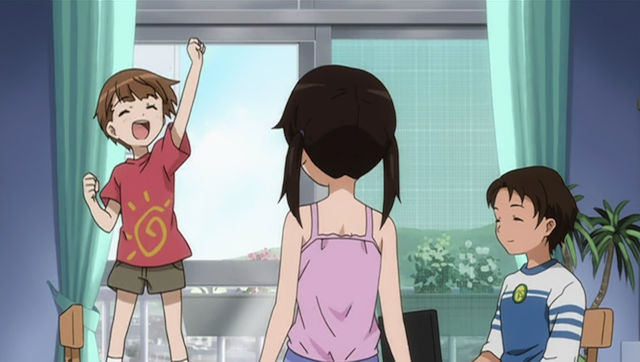 Tamayura ~hitotose~ is an expansion of the Tamayura OVA that I reviewed previously. This is an example of the “healing” genre, and is directed by Junichi Sato, the master of this genre, and the director of Aria (he also worked on a recent work in the genre, Ikoku Meiro no Croisée). For those who don’t know, some aspects of the “healing” genre, especially Sato’s work, are a strong grounding in a particular place, the power of human relationships to bridge gaps and sustain us, the nobility of work done by human hand, and the potential to make a fresh start (or perhaps better phrased, the opportunity the future brings to those willing to face it). I’ll take a closer look at these themes below. I was looking forward to this series because I’m a fan of Sato’s work, but I wasn’t sure how much the OVA could be expanded. Having now seen the first episode, I can happily report that this first episode already expands the story of Tamayura, adding important details by exploring the story of the months prior to Fu’s arrival in Takehara. This was a very good first episode, and I am looking forward to following Tamayura this season. If you look in the background, you will see that this is a historic location in the real town of Takehara, on the Seto Inland Sea, the main location for this show. 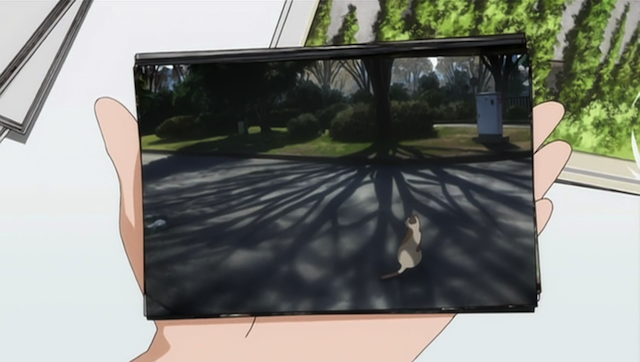 Other shows by Junichi Sato take place in what seem to be artificial environments, but the details of the environment in which the characters live are always important. Aria took place on Mars, but it was a future Mars that had been terraformed, and the city in which the characters lived was a replica of the Italian city of Venezia. Ikoku Meiro no Croisée took place in Paris of the late 19th century. In Tamayura, the location is Takehara, a small historic community near Hiroshima, and described by the main character, Fu, as “the town my father loved before he went to Heaven”. 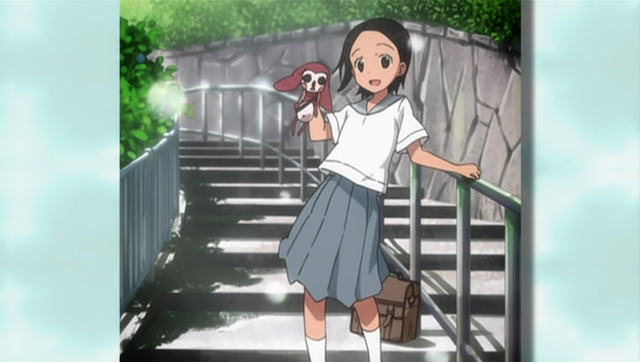 Chihiro-chan, doll-maker and good friend (holding Puyusuke). Much of this episode is about the end of Fu’s grieving. Her good friend Chihiro continues to tread lightly around any subject that might remind Fu of her father’s death, but Fu has come to realize that she doesn’t want to lose her past, but rather reclaim it. 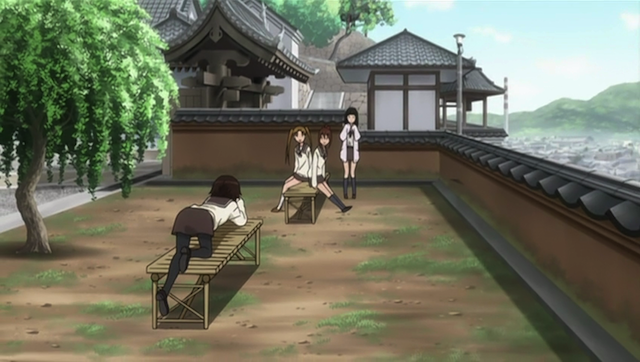 Thus, when she needs to decide where to go for high school, she decides to return to Takehara. Fu (center), with Kou and mother. Although her father is merely a collection of memories, Fu is supported by her friend Chihiro, and her mother and younger sibling, Kou. While the works of Makoto Shinkai stress the distance that human relations struggle to overcome, the “healing” genre stresses the ability of human relations to overcome those distances. It might seem trite, but it is an essential point of the genre, so people who want to wallow in misery, should probably be watching 5 Centimeters Per Second instead. 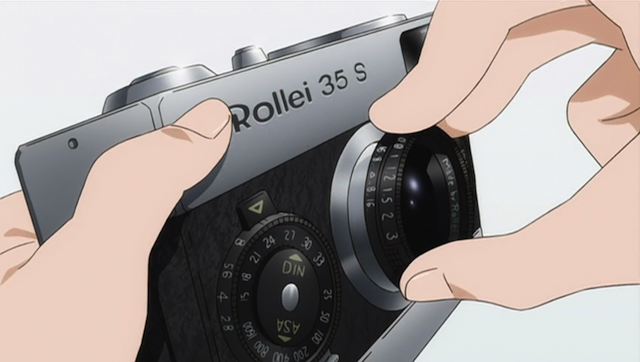 The camera Fu inherited from her father. Chihiro's room is FULL of the dolls she has made. Another aspect of Sato’s work that I really enjoy is his respect for the activity of working by hand. Ikoku Meiro no Croisée, of course, featured the work of an ironwork sign maker. Aria was mostly the activities of girls learning to row boats, but also included episode plots based upon digging up potatoes and painting a sign-pole. 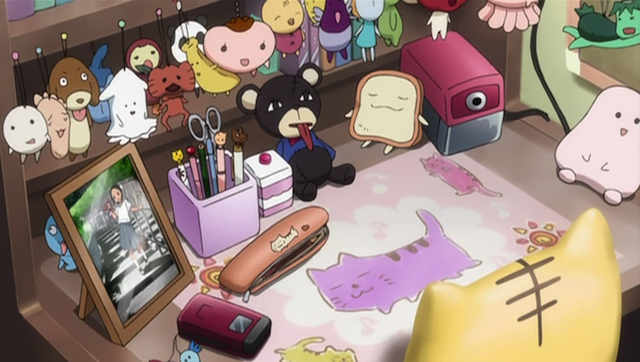 Here creative activities are the main focus, especially photography, but this first episode shows off Chihiro’s doll-making, and even hints at Fu’s mother’s love of cooking, as she says that she has always wanted to work in a café. A ticket to ride, with no pre-determined destination. Finally, I’m really glad that the OVA was reworked by telling us about Fu’s decision to move to Takehara. Like Akari arriving in Neo-Venezia, or Yune arriving in Paris, Fu’s move to Takehara is an opportunity to seize her future. Regardless of previous difficulties she is heading boldly towards her own future. 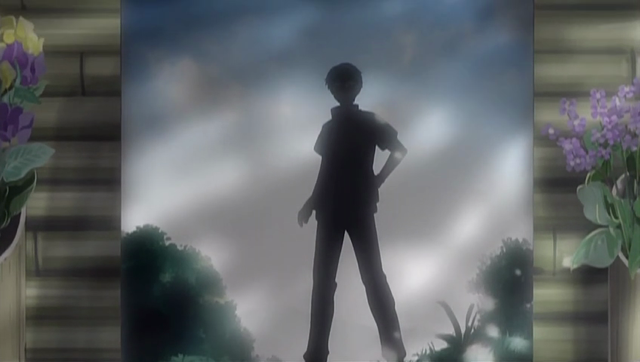 In the OVA, Fu had already arrived in town, and had started to make her adjustment. I feel this first episode, by taking us through the process of her deciding to return to Takehara, showed a lot of important development already that was skipped over in the OVA. As I said, Tamayura ~hitotose~ has all of the characteristics of a true “healing” genre anime, and I am very glad to include it in my Spring 2011 viewing. 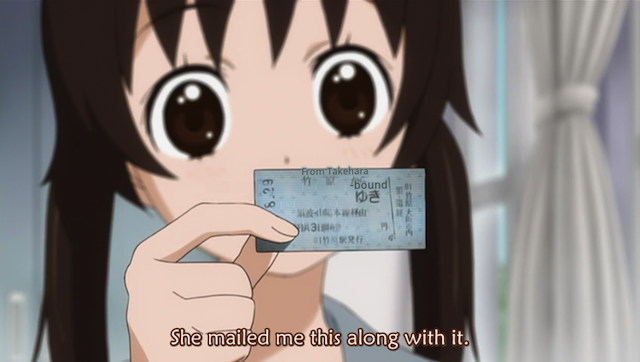 Comments Off on Tamayura ~hitotose~ 1 – did you make these yourself?